A woman went on a video rant last week about her issues with the #BlackLivesMatter movement. After her video went viral, she then took her misguided thoughts on a bit of a media tour. While she has the right to her anger, her thought process is severely flawed; when a message has speckles of truth surrounded by poison, it’s still counterproductive. Let’s begin with her views on “black on black violence”. There is a perception funded by white supremacy and shoved down her throats through most media outlets that blacks are violent by nature, all the while ignoring the fact that the rate of crimes against people of the same race are virtually the same for every race, including whites. I could go on and on about the dozens of reasons why this rhetoric is problematic (some of which you can read here), but I will just say this: “Black on black crime” is just another tactic in the many attempts to disqualify the validity of the black life, and it is very disappointing when people (especially those of color) fall for it. Secondly, let’s address her twisted idea that white privilege doesn’t exist. Privilege comes in many different forms, as I discussed in this post. However, it doesn’t take much intelligence to see the vast advantages afforded to whites in this country over minorities. To ignore this simple truth is pure idiocy. Should this fact be used by minorities as an excuse to not try? Absolutely not. However, I learned very early on that I had to work twice as hard (and behave twice as much) as my white counterparts in order to stay afloat. Should we as minorities expect reparations for what our ancestors went through? Yes, but not in the way most people would like. 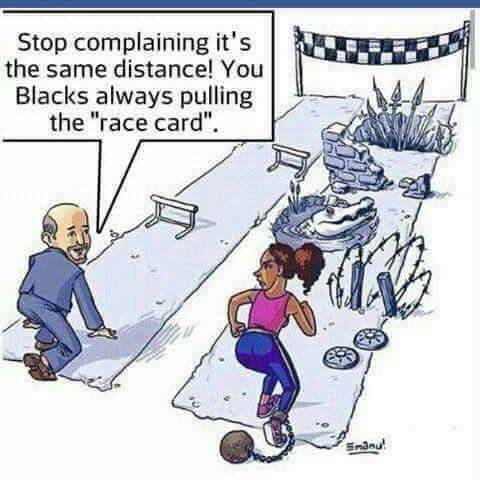 The kind of reparations I’d like to see is equality: in education, employment, housing, law enforcement, etc. Giving people a sack of money will do nothing for the plight of the oppressed without the education needed to sustain it. While I’m sure her heart was in the right place and her frustrations coming from a place of validity, I cannot overlook their detrimental nature. Instead of providing solutions to ending systemic racism, or even suggestions on how to improve the #BlackLivesMatter movement, she choose to spew a type of rhetoric best left in the Jim Crow era: keep your head low and don’t argue with the white folks, or you deserve what’s coming to you.